You drive by our campus everyday, but have you noticed the beautiful murals on the construction wall across the street from IPA? Those murals were designed and painted by ISLAND PACIFIC ACADEMY Elementary and Secondary students. 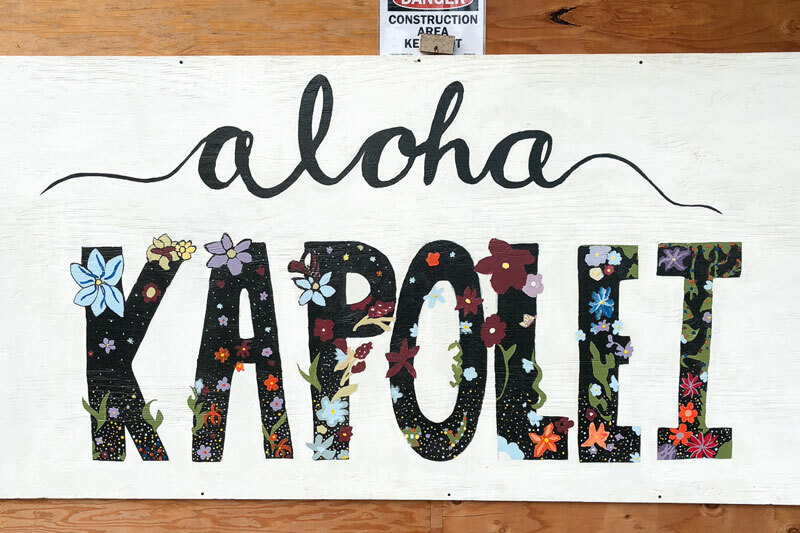 With the construction project of Kulana Hale along Haumea and Wakea street starting, a large plywood construction wall was erected along the street. Elementary Principal, Steve Ross, and Head of School, Gerald Teramae, saw this blank canvas as an excellent opportunity for IPA to work with our new neighbors in helping to beautify the community. Mr. Ross approached Geoff Mowry, Operations Manager of CMC Rebar Hawaiʻi, who is involved in the project and also happens to be an IPA parent of Grade 2 student Bella (’29). He proposed having IPA students help to decorate the construction wall with a few painted murals. Mr. Mowry liked the idea and was instrumental in facilitating a collaboration with IPA, helping to build partnerships in the community and become good neighbors. Mr. Mowry also volunteered to come in as guest speaker for the Grade 2 class during their unit on Community to talk to the students about the Kulana Hale project. Both the Elementary and Secondary divisions were recruited to create the murals. Elementary art teacher, Katie Davis, took the lead for the Elementary school, and Middle school ceramics teacher, Warren Andrade, headed up the Secondary school’s efforts. They both had the students design their murals to reflect what community means to them. Working with the Grade 2 students, Mrs. Davis had them create individual drawings of things that represent Hawaiʻi and Kapolei to them. The students came up with many different and creative ideas, including pineapples, shave ice, rainbows, monk seals, flowers, and sea creatures. Mrs. Davis then consolidated the ideas and sketched them out on four 4×8 plywood boards to make up Elementary’s section of the mural. All of the Grade 2 students had the opportunity to help paint the mural during their art classes. 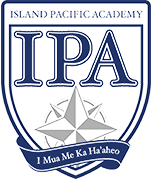 They even included the IPA shield, recognizing what an important part ISLAND PACIFIC ACADEMY is to the Kapolei community. 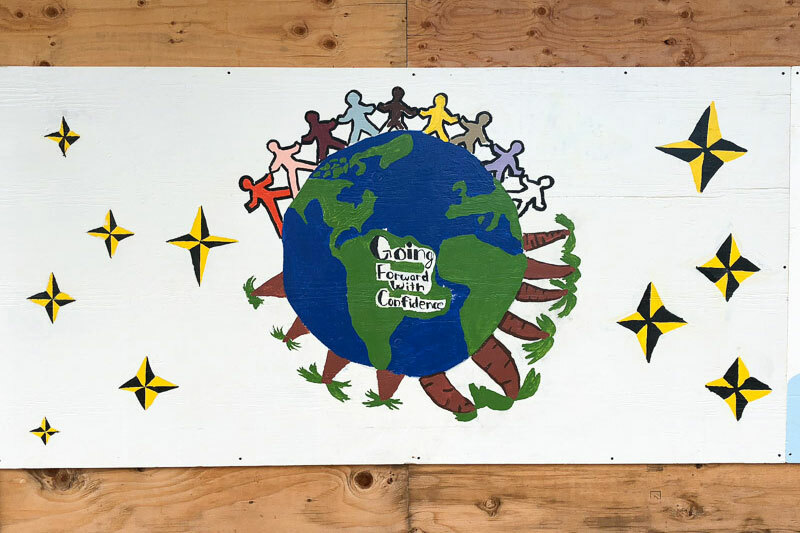 In the Secondary school, Mr. Andrade gave students in his Grade 8 ceramics class and his Grade 9-12 ceramics class four 4×8 plywood boards each to design and paint on their own, with the only direction being that their murals should reflect the idea of “community.” The Grade 8 students came up with four great designs incorporating the Hawaiian islands, rainbows, flowers, and the IPA compass rose. 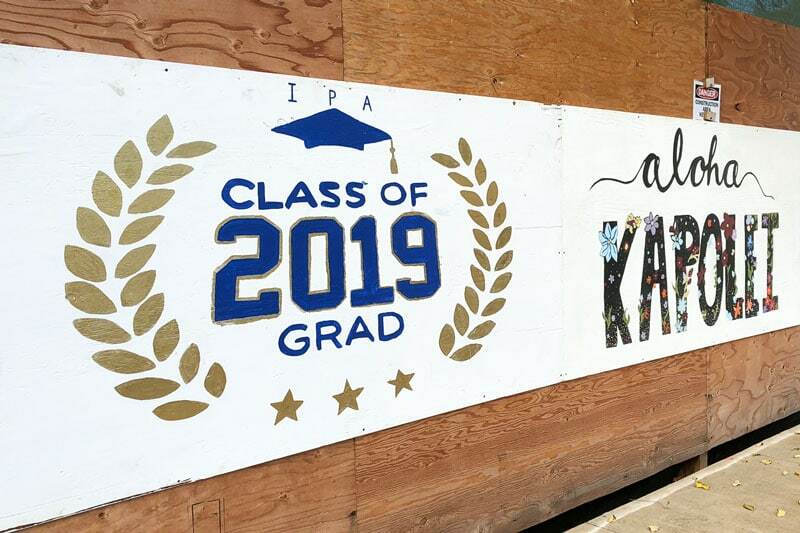 The high school students showcased the Class of 2019 and the IPA compass rose of the Navigators, and created an “Aloha Kapolei” mural to tie the whole project together. Be sure to take a look at ISLAND PACIFIC ACADEMY’s art in the community the next time you pass by. 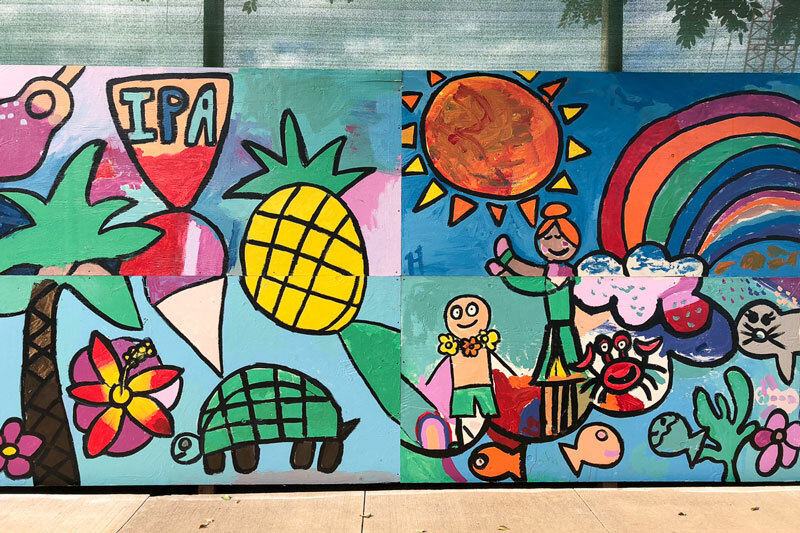 It is a nice visual reminder of IPA’s important role in the community, and reflects our school mission to provide opportunities for our students to become involved citizens both within their communities and the world and to give back whenever they can. 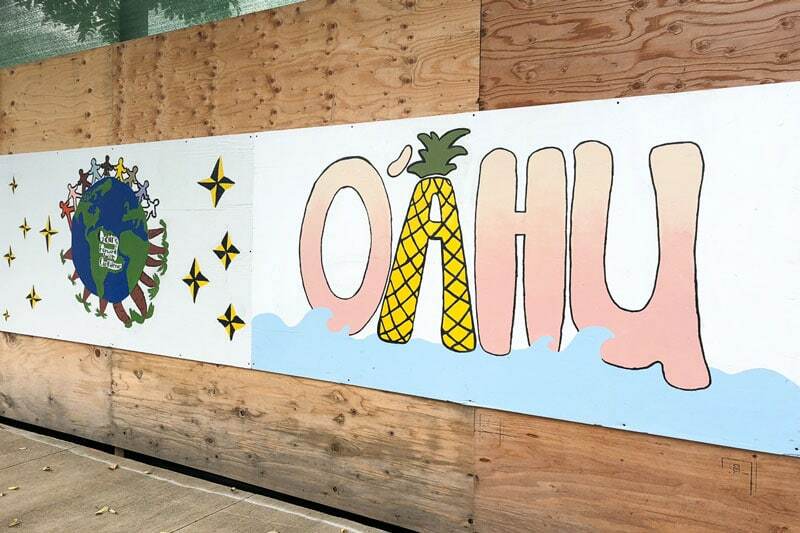 The Grade 9-12 students created this mural “Aloha Kapolei” as their contribution to the community. The Class of 2019 showed their school pride with this mural celebrating our seniors. The murals for the Grade 8 students and Grade 9-12 students. 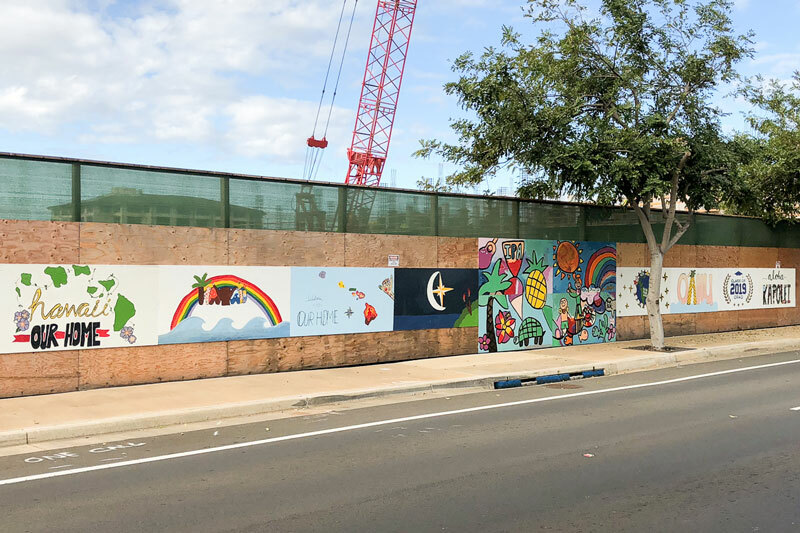 Grade 2 students created a colorful mural with all of the things that mean community and Kapolei to them. Student murals posted along the construction wall. The Grade 8 students mural shows IPA students as part of the global community, going forward with confidence. ← Happy New Year! Akemashite Omedetou Gozaimasu!